If, like us, you’ve been thinking about an African safari for ages but always found an excuse: it’s too far, I have to get vaccines… follow our advice, it’s time to put your fears behind you and embark on the adventure of a lifetime. When you do, make sure you organize the trip thru a specialised travel agent, the choices are overwhelming otherwise. My goal was seeing as many elephants as possible so mine organised our trip to southern Africa for their winter (August), when foliage is arid and it’s much easier to spot them. We flew from Johannesburg, South Africa to Skukuza, a hub next to the iconic Kruger Park. That’s where we get our first surprise. The intimate airport is gorgeous, spotless and its staff are the kindest people I’ve met. This becomes the norm throughout the whole trip. Our first stop is Sabi Sands, a private reserve next to Kruger. Its key advantage is that, at Kruger, you can only glimpse animals from the road. In Sabi Sands, the guides are free to drive off road to be next to the animals. The Savanna Lodge leaves us speechless. The rooms are luxury tents next to a watering hole where we only have to peek out of our window to see hippos and elephants bathing away. At night, we need to be walked to our room by a guard, in case a dangerous animal shows up unexpectedly. We catch our first sunrise, which looks exactly like the one in The Lion King, with zebras against what looks like a humongous orange muffin. We go on our game drive with an extraordinary guide and a tracker in an open air Jeep. Fortunately, the animals dismiss us as one big, non-threatening object, which allows us to stay three feet from them in complete awe. The main rule is: don’t stand up because, then, the animal would identify you as a threat and charge. In just a few hours, we saw four of what are usually called “The Big Five”: Buffalos, elephants, a rhino family and a female leopard cleaning her cub with her tongue, just like a regular cat. We witness a magical sunset at a lagoon overflowing with hippos and a Kingfisher bird deep diving to get his prey. Our second day starts in full Lion King mode. Six Pumba warthogs graze on their knees. Alas, Timon, who doesn’t live in this neck of the African woods, doesn’t show up. Next to appear is Zazu, the red-billed bird, and the wildebeests who traumatised kids around the world by killing Mufasa in a stampede. We also see a pack of hyenas, who astound us by being big and beautiful up close. They appear relaxed until they see a potential prey in the horizon and they scram. We are lucky to stumble upon the world’s fastest animal, the cheetah, while she x-rays her surroundings looking for lunch. She poses like a supermodel on a branch, relieves herself to mark her territory and, all of a sudden, slips and falls off, looking awfully clumsy and embarrassed. 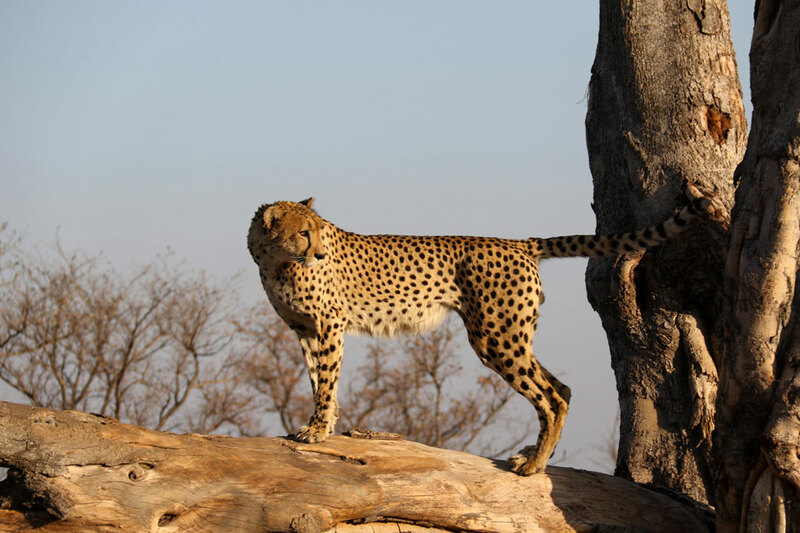 The leopard, who killed an impala the day before, moved the leftovers to a tree branch so hyenas can’t reach it. Hundreds of buffalo barge into a watering hole in what becomes an overwhelming spectacle with grunts’ surround sound and a piercing smell. In one of our breaks, two groups of elephants surround us unexpectedly. They greet each other by entangling their trunks. The time we spend next to them, in complete harmony, while they relax and eat tree bark is a powerfully moving experience. Soon after, we glimpse a rhino scratching his chest against a bush, striking a downward dog pose literally out of a yoga class. When we get back to the lodge, a family of Vervet monkeys awaits by our room. It’s hard not to feel a bit like Tarzan! We are really sad to leave, but Botswana beckons. Our first hotel is the Chilwero Sanctuary by the Chobe River. 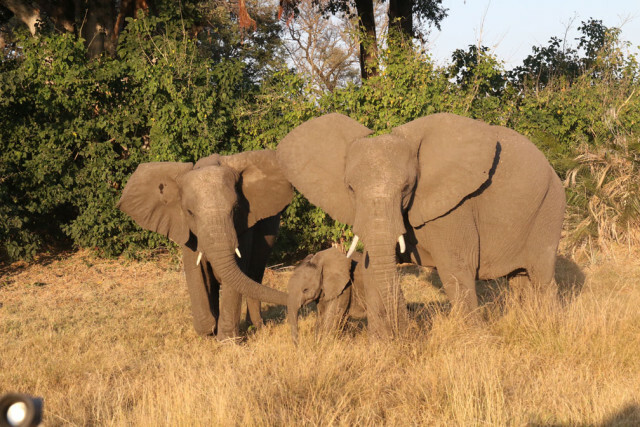 In its waterways, across from Namibia, over 80,000 elephants thrive triumphantly. The crocodiles’ shiny eyes, peeking above water, are our guides while we enjoy the dazzling show from the hotel’s boat. We snap a picture next to a 12-foot croc cooling himself with his jaw wide open. It’s the first time we feel a tingle of fear in our trip. A hippo doesn’t seem to like us and charges towards our boat. We take the hint and dash towards our final destination, the delta of the Okavango River. This is the largest interior delta on Earth and one of its most fertile ones. You can only reach it by small plane, landing on a tiny strip surrounded by trees with fruit like huge sausages. Our travel agent warned us that the beauty of this place is overwhelming and he sold it short. We felt like we walked into the Garden of Eden. Our boutique lodge, Kwetsani, has five tree-top rooms next to a forest where elephants roam freely. At night, they scratch their backs on the poles holding our room, making it shake like a 6.2 earthquake, an exhilarating experience. 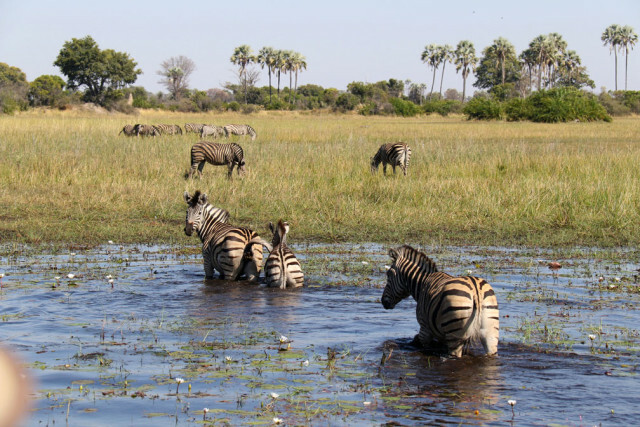 The animals’ activity is astonishing, from the dancing ostriches trying to attract a partner to baboons mating, male giraffes necking (fighting) for a female and a hippo coming out of his lagoon to defecate so he doesn’t pollute his habitat. There are hundreds of unreal-looking colourful birds, with my absolute favourite being the Malachite Kingfisher – a true marvel. I spend an afternoon taking a bath in an open air tub contemplating baby elephants nursing, protected by their daddy, who shakes the fruit off palm trees with his trunk to feed his family. This amazing sight leads to a night sky with more constellations and shooting stars that we’ve ever seen. Following their tracks, we finally spot lions. Two brothers, one of them stretching like a lazy cat under the sun, the other one eyeing a herd of wildebeests who wise up and change their route at the last minute. On our final drive, we witness a surreal moment which we won’t forget as long as we live. 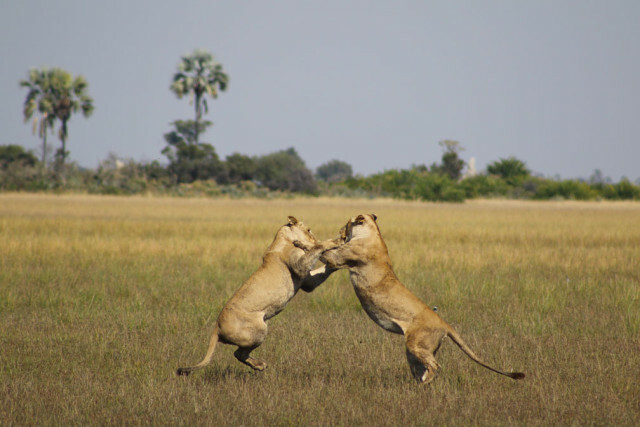 Two female lions, three feet from our vehicle play (or fight?) joyfully in the midst of a stunning prairie. It’s such a beautiful sight that we can’t avoid crying. The “Africa bug” has bitten us with passion. We have to come back and so should you.